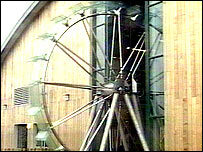 Staff at the Gaia Centre for Alternative Energy at Delabole have been told their jobs are at risk. But the owner is hoping the 21 posts can be saved if planning permission can be won for its change of use. North Cornwall District Council is due to consider a change to business use for the £5m centre which opened three years ago. But one local councillor feels that the centre should be given one last chance to prove it can be profitable. The centre, next to Britain's first commercial windfarm, was expected to attract 150,000 paying visitors a year, but had only about a tenth that number. It went into administrative receivership in March last year and in November it was bought by Neovenator, an investment company based in Surrey. It has made improvements but the company's chief executive Ian McIvor says he had no alternative but to apply for permission to use the building to create jobs, possibly in research and development and offices. He said: "Though there's not a future for the exhibition, we would hope to be able to carry on for the sake of the staff until someone new can take over even though that would be a fairly expensive option for us." Councillor is John Lugg is opposing the planning application and says it is still too soon to dismiss the centre's potential popularity. He said: "Have we got some hi-tech company waiting with bated breath to come in? "No. There is no sign of anybody and there won't be." But Mr McIvor said there was interest in the building from other companies which could create a significant number of jobs. He said: "Many people think that a building of this size should have up to 70 people working in it. "It's a substantial building and a substantial employment space. "I have no doubt that the people working here at the moment would be offered new positions." He said that if the change of use was not obtained, he would consider challenging the decision. "If planning permission is refused, the centre would have to close on 30 September and the jobs of the people working here would have to go." Councillors have visited the site and will debate the change of use proposal on 14 September.